(MENAFN - Asia Times) Russian President Vladimir Putin signed a decree in Moscow on April 12, conferring on India's Prime Minister Narendra Modi Russia's highest state award, the Order of St Andrew the Apostle the First-Called. Modi, in turn, has effusively expressed his gratitude to Putin. As he wrote on Twitter: 'Honored to receive this prestigious award. I thank President Putin and the people of Russia. Foundations of India-Russia friendship are deep and the future of our partnership is bright. Extensive cooperation between our nations has led to extraordinary outcomes for our citizens. No doubt, this is a well-earned prize for Modi. It is well-known that Modi has boosted India's defense ties with Russia and taken them to dizzying heights. He went out on a limb risking American wrath to conclude a US$6 billion deal for the purchase of the S-400 missile defense system from Russia. He also agreed to an innovative payment mechanism at the governmental level that bypasses American dollars for such transactions with Russia. These multi-billion dollar arms deals have virtually cemented Russia's stature as India's number one arms vendor for the medium and long term. The S-400 system, in particular, 'locks in' the Indian armed forces for decades to come. Arms deals are highly lucrative and the Russian companies make a fortune out of doing business with Delhi through direct secret negotiations with the government, dispensing with open tenders. The political leadership makes the key decisions in such arms deals. Now, the Russian arms industry is a big source of income for that country's economy and Putin feels greatly obliged to Modi. Putin has a habit of lavishing favors on foreign statesmen who have served Russia's interests. He once handed over a plush job with fantastic perks to the former German Chancellor Gerhard Schroeder upon his retirement from public life for having been instrumental while in office to push through the Nord Stream 2 gas pipeline project, which will help consolidate Russia's pre-eminent role in Europe's – especially Germany's – energy market. The Wall Street Journal described Schroeder as Putin's most important oligarch. But Schroeder was defiant. 'This is about my life, and I decide,' he snapped back. Modi will also take a similar attitude. But Putin's diplomatic moves are also carefully timed. The stunning part here is that he decided to underscore Russia's admiration – and his own obligation – for Modi just as the crucial Indian general election started. Putin doesn't come within the ambit of India's election code or else the Election Commission of India might have chastised him for such an irresponsible act of interference in the ongoing poll. No doubt, for large sections of the Indian public, it becomes a matter of regret that Russia is interfering in an Indian election. 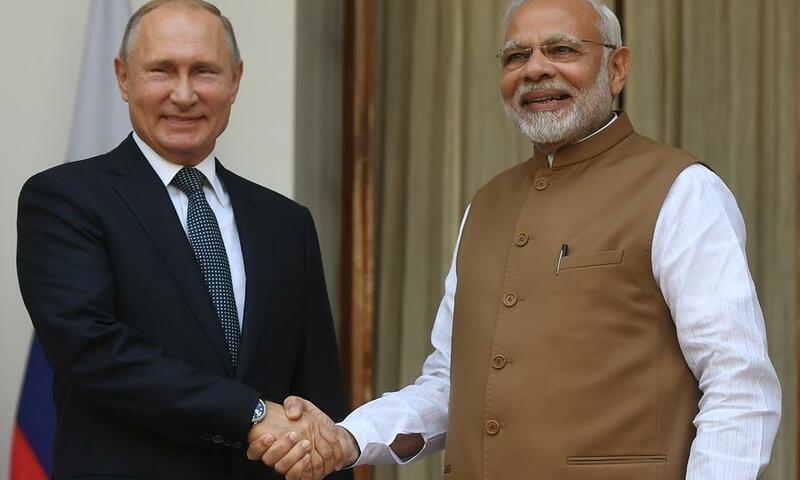 Putin has departed from a great Russian tradition of staying above India's electoral politics and dealing with the established governments in Delhi – be it under Indira Gandhi or Morarji Desai, Rajiv Gandhi or AB Vajpayee. Simply put, Putin should have announced his decision before India's general election started on April 11, or deferred it until May 19 when it finishes. Why such immaculate timing? Make no mistake that the optics are appalling and incredibly crude. This also raises troubling questions. How can Putin be so sure that India's electronic voting machines will come out with the desired results on May 23? Putin is a highly trained intelligence officer by profession and such strange behavior to barge into India's domestic politics bang in the middle of a general election is extraordinary at a juncture when Russian 'meddling' in elections abroad is still a raging controversy. Indeed, no one is talking in India about 'Russia collusion.' There isn't going to be any Robert Mueller-type inquiry, either, to fathom why Putin is investing political capital so heavily on Modi. Nonetheless, given the secretive nature of the Russian political system, eyebrows are bound to be raised within India – and more so, abroad.